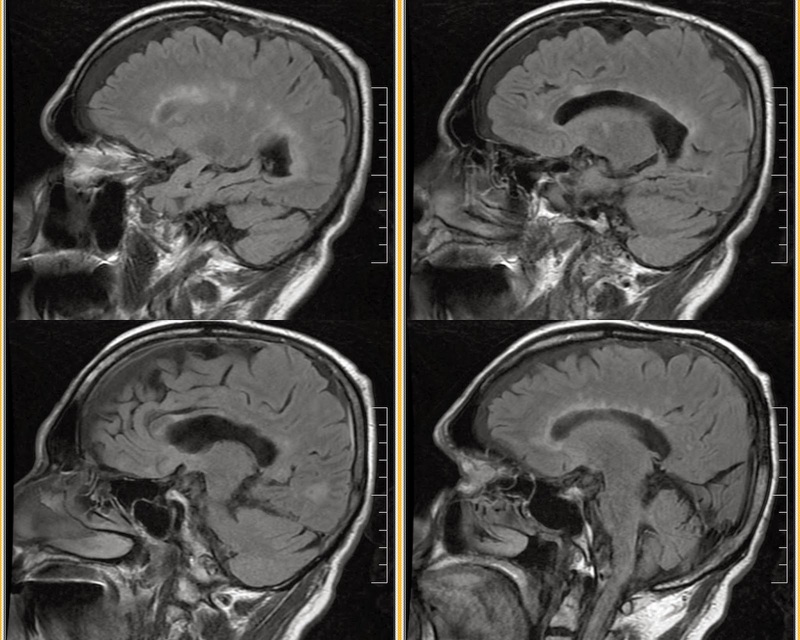 A 30 y o female with recent sudden onset double vision referred for MRI Brain and Orbit screening. Neurological notes mentions left 6th CN palsy. This MRI brain, sagittal FLAIR shows multiple linear T2 hyper intense foci involving corpus callosum and peri ventricular white matter aligned at right angle to lateral ventricle. Optic nerve evaluation within normal limits. Imaging diagnosis : Multiple sclerosis. Probable autoimmune-mediated demyelination in genetically susceptible individuals. The diagnostic clue is multiple perpendicular calloso septal T2 hyperintensities. Characteristic locations are periventricular white matter, along deep medullary veins in more than 85%. Infra tentorial in 10% adults, more common in children. Often bilateral and asymmetric. The T2 hyper intensities become confluent with severity. Size, linear to small, ~ 5-10 mm, linear, round, or ovoid; "beveled", "target", "Dawson finger", "lesion-in-a-lesion" appearance. Tumefactive lesions can be large up to several cms can mimic neoplasm. T2w images are more sensitive than FLAIR for posterior fossa lesions. "Tumefactive" MS can mimic neoplasm. Post contrast T1w, transient enhancement during active demyelination. More than 90% disappear within 6 months, may be nodular (68%) , ring (23%), Semilunar, incomplete, or "horseshoe-shaped"
MRS : Reduced NAA (NAA/Cr), increased Choline (Cho/Cr). MRS may allow early distinction between relapsing-remitting and secondary progressive disease. More than 3 discrete lesions more than 5 mm. Nuclear Medicine PET: increased Glucose utilization correlates with I NAA in lesions. 1. Eephalopathy, memory loss, confusion. Multifocal supratentorial WM lesions, always involves CC. o Unknown; increase incidence in first-order relatives. • By 10 years 50%, and by 25 years 90% of RR patients enter SP progressive phase. 3. Schilder type ("diffuse sclerosis"): Extensive, confluent, asymmetric demyelination bilateral supra-/infratentorial parenchyma. 4. Balo type ("concentric sclerosis"): Large lesions with alternating zones of demyelinated/myelinated white matter. CSF positive for oligoclonal bands. Late: Severe disability, cognitive impairment.